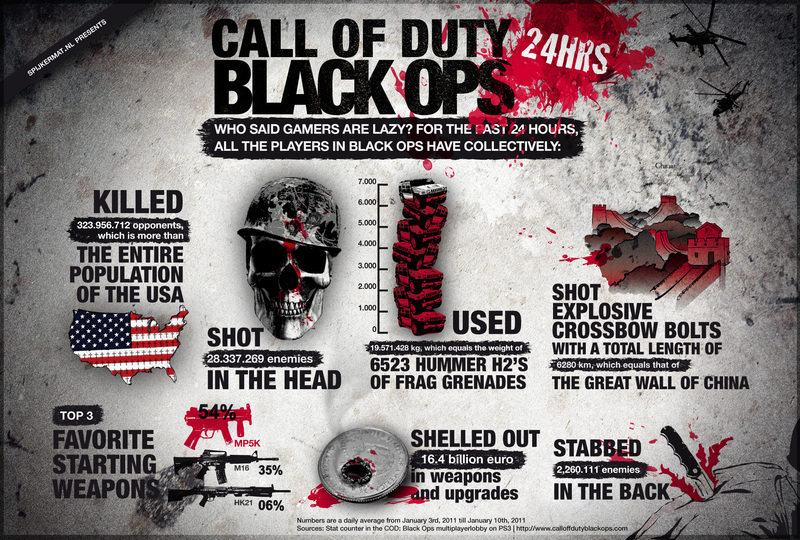 Two Call of Duty: Black Ops infographics have turned up, one showing off the simply phenomenal amount of time we’re pouring into this game, and the other comparing the game’s performance against other Wii releases. If there is a better method for comprehending large numbers than slapping some graphics and coincidentally similar figures on it, it is a mystery to me. Hit the break to have your mind expanded. Spikjermat put together a daily snapshot of what Black Ops players get up to, which you can admire below. Highlights include a greater kill count than the entire population of the US, and €16.4 billion spent on weapons and upgrades – in the space of 24 hours, remember. Meanwhile, EpicBattleAxe has assembled some delightful data on the Nintendo Channel. At most 20 percent of US Wii owners use the Nintendo channel, and it’s unknown how many of those allow their gameplay hours to be reported back to Nintendo. Nevertheless Black Ops has secured 33,287 players totting up 954,087 hours of play since its release in November. 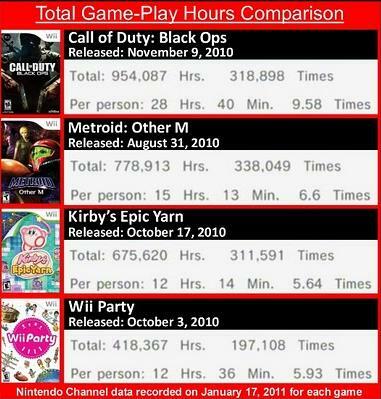 EBA compares this performance to other bestselling titles released in 2010 including Metroid: Other M, which managed 778,913 total hours played with more than two months’ advantage. Hit the links above for more details.